Volatility and the cyclical performance of active management (i.e. 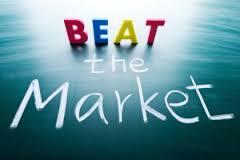 investors trying to beat the market) are really blessings in disguise for long-term investors. This might sound strange but it’s true. Columbia Business School professor and successful investor Joel Greenblatt explains why in his excellent book: The Little Book that Still Beats the Market. The point is that if the magic formula* (Market Fox: or any investment strategy for that matter) worked all the time, everyone would probably use it. If everyone used it, it would probably stop working. So many people would be buying the shares of the bargain priced stocks selected by the magic formula that the prices of those shares would be pushed higher almost immediately. In other words, if everyone used the formula, the bargains would disappear and the magic formula would be ruined! Even professional money managers who believe their strategy will work over the long-term have a hard time sticking with it. After a few years of poor performance relative to the market or to their competitors, the vast majority of clients and investors just leave! That’s why it’s hard to stay with a strategy that doesn’t follow along with everyone else’s. As a professional manager, if you do poorly while everyone else is doing well, you run the risk of losing all your clients and possibly your job! Most investors and fund managers are temperamentally unable to do this. Instead, they fool themselves into thinking that they can beat the market by investing the same way as each other, by investing in portfolios that are over-diversified or that have a high degree of overlap with a market benchmark. The result, no surprise, is that they under-perform after fees, costs and taxes.